Around the world, the Swiss made Bergeon Watchmakers Screwdrivers have long been considered the best and highest quality available to both watchmakers and jewelers. Now some think that the new micro ball bearing Swiss made screwdrivers are better, however all the votes are not in yet. 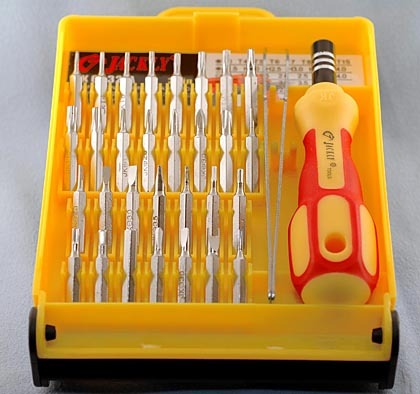 The new micro-ball bearing screwdrivers have the smallest handles followed by the Bergeon with the largest handles going to the AF French made watchmakers screwdrivers. Since 2006 Bergeon has offered the New Bergeon Ergonomic Screwdrivers, which adds more fuel to the great screwdriver debate. 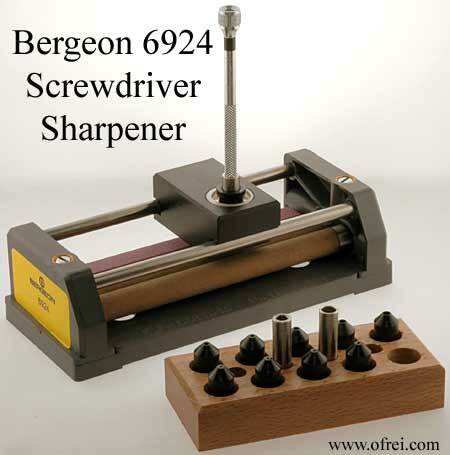 Brand New Screwdriver Sharpener From Bergeon, just introduced in 2006. The word is, from the users of these product, that this is the best screwdriver sharpener tool offered to date. They say this Bergeon tool is a lot better than the Horotec tool and is worth the extra money. We are please to offer all screwdriver sharpeners and if you can afford it, then this is the best tool to get. There are two parallel abrasive cylinders (#6924-11 round stone) that put the right curvature on your screwdriver blades. Another stone (#6924-10 square stone) that puts a flat edge on the tip of the blade. With this tool, you can save on buying replacement blades and have fewer scratches on screws and bridges. 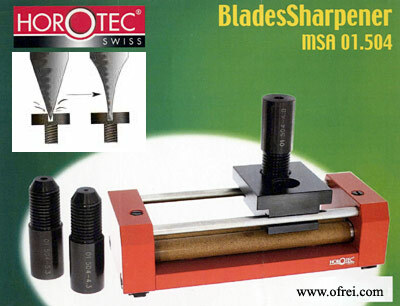 It takes a special sharpener to sharpen the perfect shape screwdriver blade. 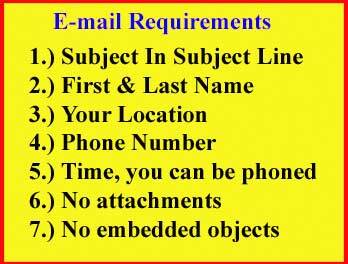 If you are working on high grade watches you might want to consider one of these. Three special bits with hole diameter 4.3 mm, 4.8 mm, and 5.3 mm can hold each of the ten sizes in correct alignment against the rounded stone. Screwdriver includes 4 blades; one each of 1.60, 1.80, 2.00, & 2.50 mm. Spare blades are stored inside the screwdriver with the removable top. 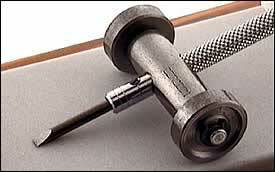 Comes with knurled handle for a sturdy grip. The original blades made with softer metal than the stainless steel blades. Some prefer to used the original blades with their Stainless Steel Screwdrivers when working with older watches that do not have stainless steel screw.